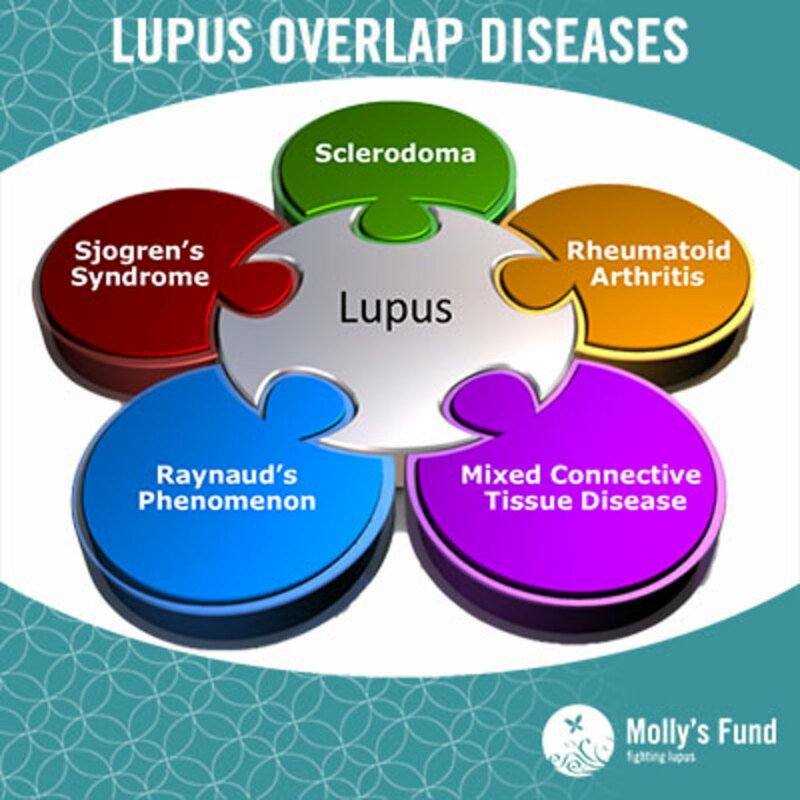 At its extreme Lupus is a life threatening auto-immune disease; however, in most cases, people with Lupus lead normal lives despite having this dangerous disease. I was very happy to see that Hubpages actually has a separate category for Lupus; Lupus is an auto-immune disease that can be life-threatening. There is a huge lack of understanding or knowledge about the disease in America and the Western World, but despite this scientists are making huge advances in research and hopefully one day we will see a cure to this and other auto-immune disease. 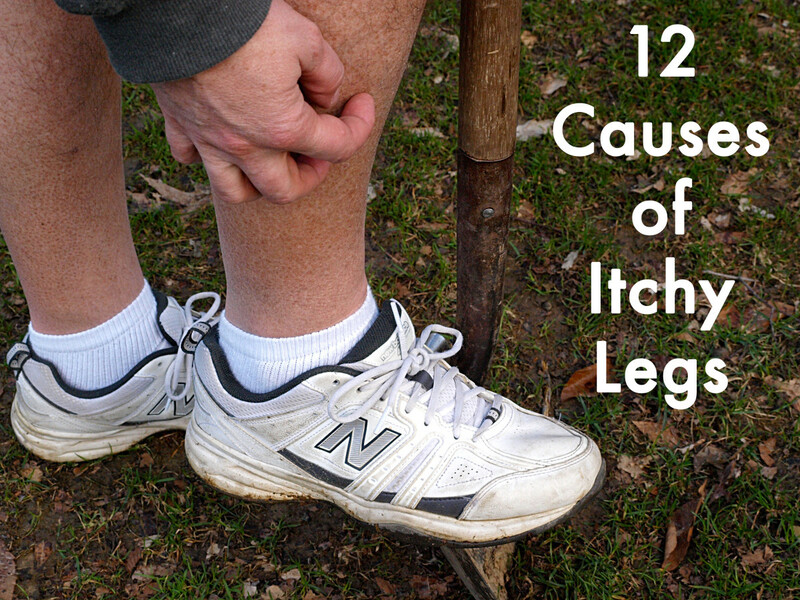 It was in 2001 when I first became aware of this dangerous disease. My wife had been feeling ill for a while and our doctor informed us that she had Lupus. We nodded our understanding, even though we had no idea what Lupus was. After some research we became really scared as we realized that Lupus could lead to death - that one word really shocked us, especially as we had never heard of the disease before. Once the initial shock was over, we researched more and then talked to some specialists – Lupus can be very dangerous, but it can also be controlled, and you can live for many years with the disease. Hopefully, with this Hub, I’ll help a few people understand more about the disease. With the current 'panic' relating to the H1N1 flu virus it's important to understand that the vaccine that is currently available contains 'live virus'. As Lupus is an immune system disease, where the immune system is weakened, most experts are advising people with Lupus not to get the vaccine - the best thing I can suggest is try to stay out of contact with people susceptible to Swine Flu - young children etc. The majority of people (90%) with Lupus WILL LIVE A NORMAL life span. Lupus is an auto-immune disease that can last for decades. Auto-immune disease are disease where the immune system fights the body and organs rather than fighting viruses. With Lupus, the immune system over-reacts and begins to attack healthy tissue and organs - these attackes can be limited, or severe and can have many far-ranging effect. What type of Lupus are there? Discoid lupus (also known as Cutaneous lupus) is a less severe variety of Lupus that is essentially 'skin deep' - generally the symptons include skin rashes, ulcers and sensitivity to the sun - additionally, tiredeness and lethargia are common. 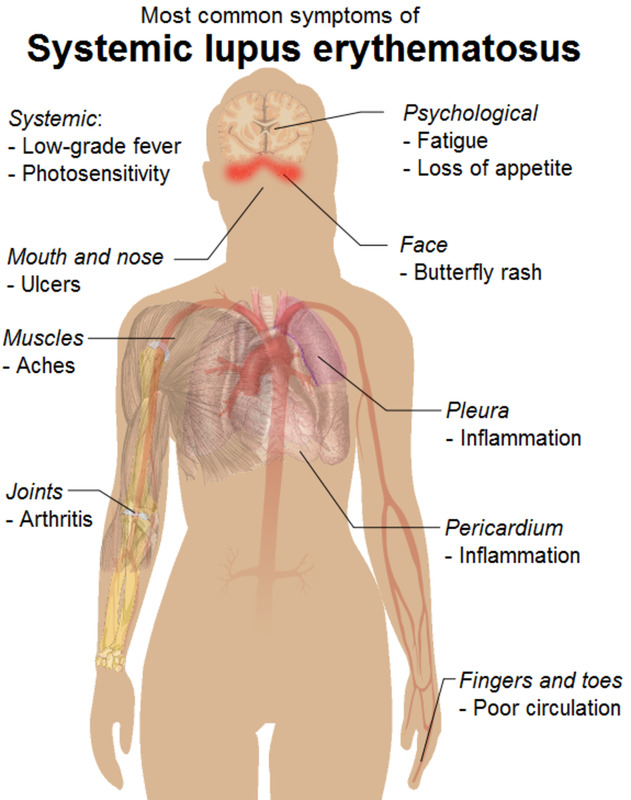 Systemic lupus is the more severe variety of Lupus. It attacks are deeper than Discoud and include severe attacks on the skin, the joints, major organs (such as the lungs, heart, kidnbeys and brain) - it can lead to severe weakness and fatigue. If I have Discoid Lupus, am I immune to Systemic Lupus? No, about 1 in 10 cases of Discoid Lupus will become the more sever Systemic Lupus - most doctors advice monitoring your symptoms, and getting regular blood tests to see if there are any changes. While there is much research going into the causes and potential cures to Lupus, no one has a clear answer as to the cause. Most suspect there are genetic triggers caused by stress, environmental or physical problems. There have been cases linked to antibiotics, infections and viruses and some people link hormonal problems. Suffice to say, know one really knows. While there is no proof, it is suspected that Lupus is hereditary - most doctor's advice children of sufferers to get annual check ups. Lupus is more prevalent in women - 7 out of 8 sufferers are women. One in a thousand Caucasians suffer from Lupus. Four in a thousand African Americans suffer from Lupus. Two in a thousand Lations suffer from Lupus. IN many cases your normal GP can treat the symptoms of Lupus. 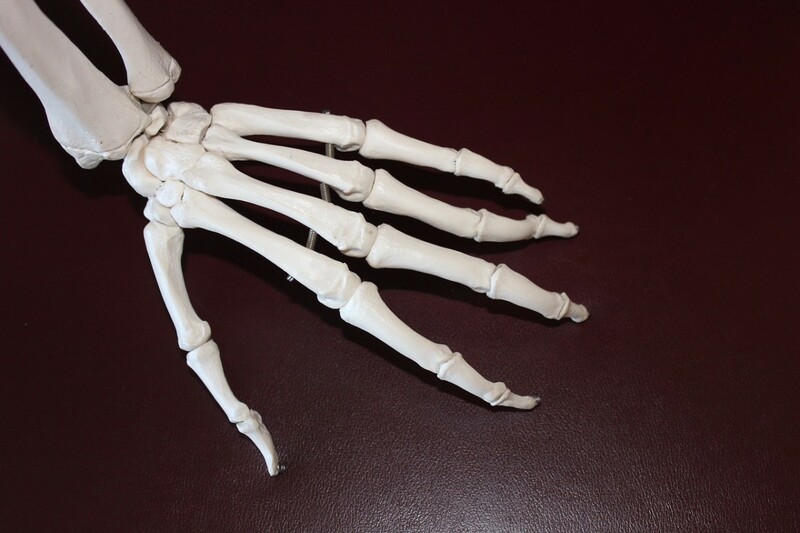 However, the more severe the disease is the more likely you should seek out a specialist such as a rheumatologist, a dermatologist or an immunologist. It is also very important that you vist the optician on a regular basis. Do all sufferrers get the same symptoms? Unfortunately no; the symptons will vary from person to person, with some symptoms being more severe for some, and simply not present for others. This makes Lupus very difficult to diagnose. I've heard about 'Flares' with Lupus. What is a Flare? Lupus can go undetected for many years with many symptoms lying dormant for long periods. 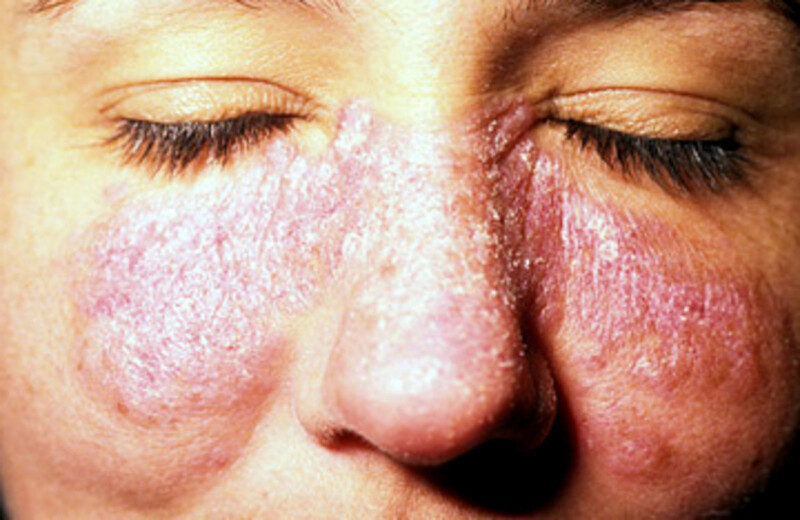 Occasionally the symptoms will appear (or flare up) signifying the Lupus is becoming active. Again this can make Lupus very difficult to diagnose. Can the symptoms of Lupus change? As various symptoms will 'flare' over time, then it seems that the symptoms are changing - also the Lupus can become more severe. However, it's likely that all the symptoms were already there, they were just not visible when Lupus was first diagnosed. Generally though, it is thought that the affected organ system remains constant. No - because the symptoms are often visible on the skin, many assume that it can be transferred by contact - this simply is not true. One of the main causes of the Lupus symptoms is inflammation - therefore many of the treatments try to control and reduce the inflammation. Many NSAIDs (Nonsteroidal anti-inglammatory drugs) are used with varying success. Additionally some doctors prescribe croicosteroids, antimalruals and cytoxic drugs (or chemotherapy) - I suggests you research each of these options thoroughly and discuss them with your doctor before accepting the treatment - each has it's benefits, but also has a down side. Nine out of ten people with Lupus will live a normal life span - with the advent of better diagnosis and better medications of the last decade, the chances of living a normal lifespan have hugely increased - some people do die of Lupus, but as time goes by the percentage is getting smaller and smaller. The two main causes of death are kidney failure or sever infection - but these are VERY RARE. Articles about Lupus on HubPages, a place where you can read and write about any topic that interests you. Very interesting article. I suffer from Rheumatoid Arthritis, which is very similar to Lupus. I found this very useful, thanks for posting this. I've heard of Lupus, but never really known what it is - thanks for the clear information. Very interesting. I've never really understood Lupus but have had a couple of family members and friends that have it. I knew they felt tired and with some their joints always hurt but it's just so difficult to understand because, as you said, it can be different. This is very informative and helpful for those dealing with it or who know someone who is. Tricia Gibson: the good thing is that there is far more known about Lupus and some great drugs are being developed. While it's early days yet there is a brighter future. My wife was finally diagnosed with Lupus about 11 years ago and back then it was a mystery and the doctor basically had to guess at Lupus - but as more people become aware and more research is done, the diagnosis and treatment is getting better. Reach out to some local Lupus groups or look on Facebook - there are a lot of people who have been living with the disease for years and they are all amazing people who are willing to help - my wife is in contact with several people all the time and it helps my wife to know there are people who understand what she is going through. Thank you for answering. It is so hard for me to figure out how this all came about. Being a very active person doing yard work, working with my horses, etc to now having to cover up in the hot weather is unbelievable. I'll do it for my health, but I am still totally baffled by all of it. Tricia Gibson: no one knows what triggers Lupus. It could be genetic, or it could be environmental. I note that my wife used to be in the sun all the time too and perhaps that is what triggers it - it seems to be different for different people. I just found out that I have Discoid Lupus. I grew up playing in the sun and still in it today. I have horses and do outside activities all the time. No one in my family had this. I need to know if the Swine Flu shot, H1N1 could have triggered this? Please help! I need answers! Thank you. Thank you so much for your response. I would be grateful if you could tell about what things should my sister avoid and take care of to live a more normal life. Suraj Prakash Aryal: it really depends on the Lupus and how severe it is. In many cases the sufferer will have a normal life most of the time and then spend a few days in bed occasionally when they have a flare up. The key (at least for my wife) is understanding that you have to listen to your body when you have a flair up. Lupus can be managed very effectively and there is a lot of research going on that should benefit your sister over time! There is always hope and with your support (and the rest of the family) your sister will learn to cope with Lupus and lead a pretty normal life. Thank you so much for the information. I am very scared about this disease as the doctors are suspecting that my sister is suffering from this disease. She is just 19 years old. I would like to ask one question, "Will she be able to live a normal life or will have to change her lifestyle??" This is such an excellent, quite comprehensive summary of SLE. It is really helpful to people trying to research this topic, so thank you! kidney failure is not rare , and it goes along with the liver failure , your Hub was informative to those who do not know , you spent a lot of time on it and it was very good . My daughter has both types of lupus , both D.N.A. strands , she has had it since she was born and her time is dwindling at a painful rate , she is going to be 24 soon . Lupus is a very cruel disease. Thank you for sharing your lupus information . I pray for your wife that she has a full and wonderful life. God Bless . Most deaths created by lupus ..is drug abuse , because people cannot handle the pain anymore in severe cases . Trammadol is a non narcotic pain medication , non addictive , i cannot advise people to use it , but i can say that my daughter use to take it because she did not want to be addicted to pain medication . west monroe girl: it really depends on many things. Each person is slighlty different and what works for one person may not work for another. Your dr. will know you and have a better handle on your symptoms. The one thing my wife found was that simply knowing what she had was a relief. Just found out I have lupus & am in horrible pain... What are the options for pain management? I go talk w/ my dr next week to discuss this. Thank you for the very insightful hub. I have heard about lupus before, but I did not know much about it. Your information was very clear. My prayers to you and your family. Great hub on such a misunderstood disease! Knowledge is power. My prayers go out to you and your wife. Sexyladydee: thank you for your prayers and for spreading the word with your wonderful hub! My prayers go out to you! I was diagnosed with Lupus in 2008 and it's been one roller coaster ride. Dealing with the pains and aches everyday can be a strain but it's something that I've gotten use to. I pray that they find a cure soon. I wouldn't want anyone else to suffer with this. I have just come back from the Hospital where I have been told I may have lupus? I have been under going observations since October but have had problems for round a bout 15yrs. My symptoms seem to have got worse when I lost my sister 5yrs ago, don't suppose anyone knows if that is the reason I have developed Lupus? i have been given a steriod injection, my second one in 3 months, and have had several blood tests. I also had to have a dry eye test and am waiting for an ultra sound on my kidneys. I have also been put on medication but am not sure of what it is called? I got told 2yrs ago I had Rayunards and was put on nifadepine, i was taken off them 3 months ago. My beautiful sister just recently past away from this horrible disesase. She was diagnosis with systimic lupus 5 years ago after the brith of her son. A year ago her health got worse when doctor diagnosis her with pulmonary hypertension along with lupus she did not have a fighting chance. after fighting the battle with (SLE and PH) her boby could not take it no more. We just celerbrated her 32nd brithday I never image it would be the last brithday I would spend with her . My sister passed away 3 years ago from lupus. From diagnosis to death it was 6 years. This is a horrible disease with no cure. There are new medicines out now that can 'control' flares of lupus. This disease runs in our family with all females (including myself) and one uncle who has it (his was caused by paint fumes). We all have systemic lupus. It is definitely genetic and environmental. Stress is one of the 'triggers' of lupus. When my sissy passed, she donated her body to the Miami Medical Center in hopes of finding a cure/cause for this evil disease. God Bless and I wish all the best for your wife and family. LynFerrand: I am sorry for your loss - for me it is a very worrying disease because so little is known about it - there's a whole bunch of autoimmune diseases out there that are all very dangerous but get little or no coverage - hopefully now we will see more research into these areas. I lost my sister to this disease in 1989 when very little was known about it. She was being treated for rheumatism and high blood pressure at the time and it was a great shock to hear that she had been taken into hospital and died shortly after. She was 58 years old and left a husband and two sons. I am pleased that there is now more research happening. Thank you for your very interesting hub. Kalux - I hope your mother benefits from all the recent research! What amazed me mostly is that it's not just normal people who are ignorant - a lot of doctors don't know much about Lupus! Thank you for this interesting article. I've always wondered about Lupus and here you have written an excellent hub about it. Everyone - thanks for the kind words! This is such a devestating disease, and it's amazing how many people have never heard of it! There's a whole bunch of auto-immune diseases that really are neglected - it's only in the last couple of years that research has really picked up and there does seem to be a light at the end of the tunnel! Very informative hub on Lupus. More need to know about it so a cure can be found.